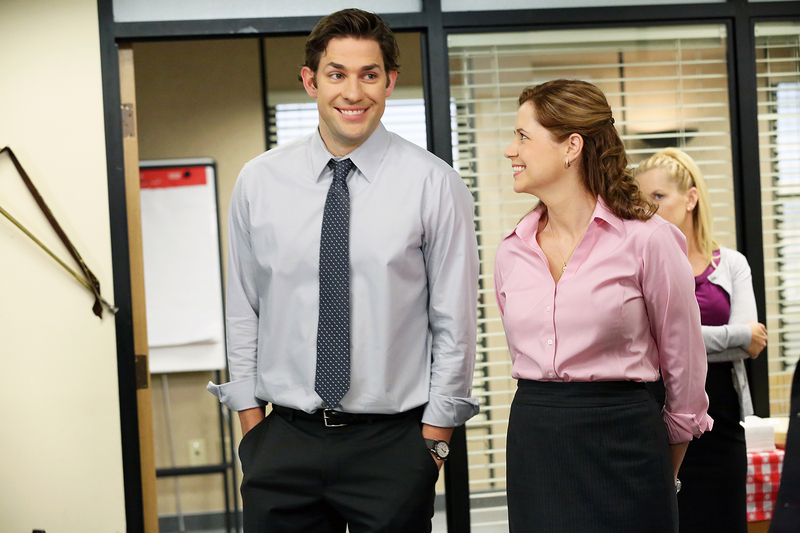 The Office's John Krasinski and Jenna Fischer Reunite: Amazing Photo! The Office’s John Krasinski and Jenna Fischer Reunite and It’s Magical: See the Photo! Jim and Pam! John Krasinski and Jenna Fischer reunited this week — but not in Scranton, Pennsylvania. The Office costars took a selfie together in NYC on Tuesday, April 26. Fischer, 42, caught up with her former TV husband following a performance of Krasinski&apos;s play Dry Powder at the Public Theater. The show, which will end in May, also stars Homeland&apos;s Claire Danes and Hank Azaria. "Sooooo….This rabid theater fan came to #DryPowder last night," Krasinski, 36, captioned the Instagram photo. Krasinski and Fischer played Jim Halpert and Pam Beesly on the NBC comedy (an adaptation of the British original) from 2005 to 2013. The beloved Dunder Mifflin employees were the best of friends, often poking fun at their boss, Michael Scott (Steve Carell), and coworker Dwight Schrute (Rainn Wilson). Lovable Jim, who pined over Pam for some time, finally made a move when he kissed her during the "Casino Night" episode in season 2. They married in season 6 and later had two children. Back in January, Fischer said that she was "genuinely in love" with Krasinski while filming the series. "It&apos;s a really complicated thing, but, I mean, he was like a type of spouse that I had for a long time. He was my partner. We will always be close because of it," she said during Watch What Happens Live. Krasinski, however, wasn&apos;t on the same page. "I think that was wildly misquoted or taken out of context," the Hollars star told The Daily Beast on January 25. "I&apos;m sure she was trying to say something nice about how genuine the acting relationship was, of bringing a relationship that became that popular onscreen — and I think we both feel it&apos;s such an honor to be a part of that relationship. As far as how she was quoted about saying we were &apos;genuinely in love,&apos; I think that was taken wildly out of context and I feel bad for her." In real life, Krasinski is married to actress Emily Blunt. The couple are parents of daughter Hazel, 2, and are expecting their second child. Fischer is mom of son Weston, 3, and daughter Harper, 23 months, with husband Lee Kirk.